Dr. Clarke was an advisor and personal friend to both Kwame Nkrumah and Malcolm X with whom he was instrumental in drafting the charter for the Organization of Afro-American Unity. He was a consultant for the Budweiser “Great Kings and Queens of Africa” series and was the subject of a documentary, “John Henrik Clarke: A Great and Mighty Walk. His articles and conference papers on African and African American History, politics and culture have appeared in leading journals throughout the world. The John Henrik Clarke Collection at the Schomburg Center and Atlanta University Center house the majority of his books and documents. A U.S. Postal Stamp to honor Dr. Clarke would be an inspiration to students, educators and scholars throughout the nation. It would also be a fitting tribute to an Army veteran and social activist who devoted his life to protecting the personal and intellectual freedoms of all Americans. Getting a new postage stamp suggestion accepted is a real challenge. Each year, the Postal Service receives over 50,000 proposals recommending subjects for stamps. The suggestions and proposals are evaluated by the Citizens Stamp Advisory Committee who send their recommendations to the Postmaster General for the 25 to 30 new subjects for commemorative stamps issued each year. You can honor the legacy of Dr. John Henrik Clarke by writing letters or postcards in support of a commemorative stamp in his likeness. They may be sent to: Citizens’ Stamp Advisory Committee, U.S. Postal Service, 1735 N. Lynn Street Room 5013, Arlington, VA 22209-6432. The Committee does not track how many individual people submit a stamp design, only the number of postcards and letters they receive. Please use our sample letter as a guide, or you can sign your name and address and mail the letter to the Committee. You can duplicate the letter and distribute it to your friends, family and co-workers. We ask that you make a commitment to send one letter a month for one year. 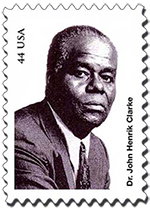 I am writing to express my enthusiastic support of a United States Postage Stamp honoring Dr. John Henrik Clarke, educator and activist. Dr. Clarke was the oldest son of an Alabama sharecropper family and rose to prominence as an educator, scholar, activist and historian who was admired worldwide. He has written or authored more than thirty books and articles which have been translated in more than a dozen languages. He was the first president of the African Heritage Studies Association and was a founding member of the Black Academy of Arts and Letters, the African Scholars’ Council and The Association for the Study of Classical African Civilization. He has received over a dozen citations for excellence in teaching and was Professor Emeritus of African World History in the Department of Africana and Puerto Rican Studies at Hunter College. Dr. Clarke served his country as a Master Sergeant in the U.S. Army Air Force during WWII, and was an advisor to both Kwame Nkrumah and Malcolm X. He was a consultant for the Budweiser “Great Kings and Queens of Africa” series and was the subject of a documentary, “John Henrik Clarke: A Great and Mighty Walk. I urge the Committee to consider and approve a stamp to honor this great African American scholar.